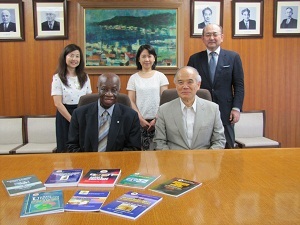 On July 18, 2013, Professor Francis Allotey, President, Ghana Academy of Arts and Sciences paid a courtesy visit to Professor Takashi Onishi, President of Science Council of Japan (SCJ) and Dr. Fumiko Kasuga, Vice-President of SCJ in Charge of International Activities. Professor Allotey's visit was to discuss the possibilities of academic exchanges that can contribute to the development of science and technology in Japan and Ghana as well as in Africa. The topics of discussion also covered a prominent Japanese microbiologist Dr. Hideyo Noguchi (1876-1928) who did research on yellow fever in Ghana; with this historical link with Ghana, Japan has supported medical study in Ghana over the many years. President Onishi and Vice President Kasuga explained the collaborations with Africa as well; recently some African countries participated in G-science Academies' Joint Statements for G-8 Summit; an exhibition booth for the Joint Statements was set up in TICAD V (Tokyo International Conference on African Development V) which was held in June 2013 in Yokohama; there have been friendly exchanges with representatives of African Academies in international meetings like IAP (The Global Network of Science Academies). When introducing their own academies such as in institutional characteristics, roles in the societies and recent and future collaborative activities, they pleasantly found many common elements.